The Parenting and Child Care information on this webpage is organized by the topics below. If you click on the topic in the list below you will be taken to the part of this webpage with that information. Below you’ll find two-page fact sheets in both English and Spanish on a variety of topics related to caring for preschool-aged children. For more information, visit the University of Wisconsin-Extension Parenting the Preschooler state Website at: http://fyi.uwex.edu/parentingthepreschooler/ Each fact sheet contains links to additional resources and references. Parenting information when you need it! Finding reliable parenting information and advice on the web can be overwhelming. How do you know what you can trust — especially when you are busy and there’s just so little time? 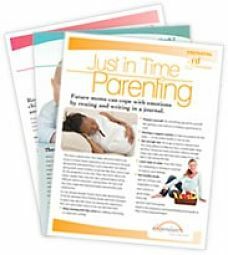 Just in Time Parenting is a free parenting newsletter that is delivered by email and specific to a child’s age and needs. They are designed so that information that’s relevant to your family is automatically delivered to you just in time! Email and birth date of child is all that is needed! All newsletters are great for grandparents, too. Pass it along! Prepare Children to Stay Home Alone – FREE Video Program! A video training program from UW-Extension can help prepare children to stay home unsupervised. The program teaches families how to develop a plan for emergencies. The video program provides tips for structuring the children’s time alone so they have plenty of activities to keep them busy and out of trouble. Your child indicates desire and willingness to stay alone. Your child accepts responsibility and makes decisions. For example, your child will follow your written directions for chores that need to be done while you are away. Your child shows awareness of what others need. For many children, these abilities can appear between 9 and 12 years of age. Other children need more time. Access the Home Alone video training online at http://fyi.uwex.edu/homealone or contact Carol Bralich at 262-335-4479. Parents of 10-16 year olds. Are you interested in learning more about what makes your tween or teen tick? Would you like the opportunity to interact with other parents who have some of the same challenges and questions as you do? Check out Parenthetical, an online site offered by the University of Wisconsin-Madison/Extension for parents of children between the ages of 10-16. Parenthetical is a combination website, blog and social network. The site provides information and discussion on a range of topics of interest to parents with children in their emerging teen years as well as opportunities for support from other parents experiencing many of the same needs and issues. Posts include subjects like parent-child conflict, discipline and limit setting, middle school romantic and peer relationships, the challenges of school achievement and much more. Parenthetical is available online 24/7 and parents can participate from any web-accessible device. Go to Parenthetical to learn more.